"This wonderfully unusual punch is my husband's grandmother's recipe. I normally don't like punch...but the first time I tried this punch I couldn't get enough! Kids love it, too. Makes a nice holiday and shower punch." Place ice cream in a punch bowl, and allow to soften slightly. Blend in milk and ginger ale. Stir until frothy. Serve at once, or keep chilled until ready to serve. Quick, easy and tastey recipe. I made it for a work xmas party, everybody loved it and I didnt have a drop to take home with me. Thanks for the idea!! 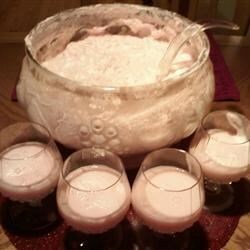 This a great holiday punch..always requested at events!